The National Partnership for Women & Families released a new report that reveals the disconnect between the care women seek and the care they receive. Listening to Mothers in California explores the views and experiences of childbearing women with an in-depth focus on maternity care. Wondering about all the amazing (and sometimes weird) changes taking place in your body during pregnancy? Check out this slideshow on the effects of pregnancy on your body and the stages of fetal development. 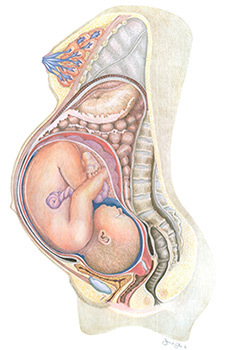 The image here illustrates a pregnancy at 40 weeks, or full term. Healthy pregnancies and full-term births can improve the health of women and babies. For many women, pregnancy is a time of excitement and joy, but also a time that can be stressful and feel overwhelming. 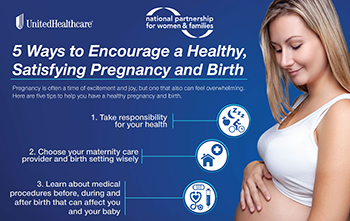 UnitedHealthcare and the National Partnership for Women & Families are working together to provide tips that help women have healthy pregnancies and births. The goal is to raise awareness about the importance of prenatal, childbirth and postpartum care. This helps families and helps give newborns the best possible start in life. Full-term births also improve the health of women and babies. That’s why these two organizations are working with media outlets nationwide to share public service announcements (PSAs) about this important topic. Being involved in your maternity care matters. We’re here to help. With so much information out there on pregnancy and childbirth, it’s hard to know what to trust. But it’s important to become informed, because the care you receive during this time can have a big impact on your health, your baby’s health and your overall satisfaction. To make informed decisions, women need access to evidence-based information and help navigating their maternity care throughout their pregnancy and birth journey. That’s why, for nearly 100 years, Childbirth Connection (now a core program of the National Partnership for Women & Families) has connected women with just that kind of high-quality information. 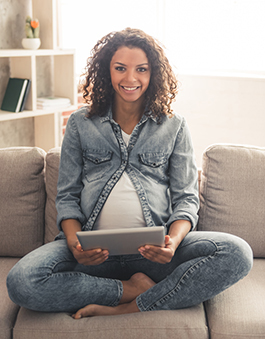 We hope this website will empower you to take charge of your maternity care and guide you in making the best possible decisions for yourself and your baby. Support our work! Your donation will help us empower women to take charge of their maternity care. Pregnancy is often a time of excitement and joy, but on that also can feel overwhelming. Check out this infographic for five tips to help you have a healthy pregnancy and birth. Make your voice heard. Tell Congress to support the Quality Care for Moms and Babies Act. We strongly support The Quality Care for Moms and Babies Act (S. 466 and H.R. 4695) as a way to improve maternal and child health in the United States. In particular, it would help identify standards that can be used to optimize care and improve outcomes for both childbearing women and newborns – especially those covered by Medicaid and the Children’s Health Insurance Program (CHIP). It would also enhance progress toward a high-performing maternity care system by addressing performance measurement gaps and supporting the work of maternity care quality collaboratives. Congress should make it a top priority.